Depart from Heathrow or your preferred airport on scheduled flights to Beijing. Meals on board. 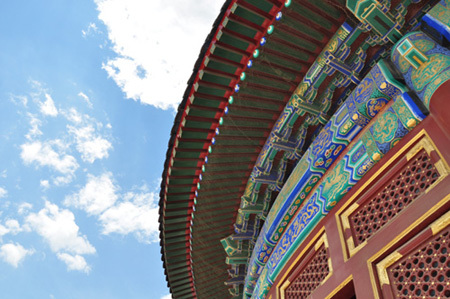 Today, enjoy a full day city tour to soak up the atmosphere of Beijing. This includes visiting must-see historical sites such as the Temple of Heaven, Tiananmen Square and the Forbidden City. Our welcome evening dinner in the evening provides an opportunity to sample a delightful selection of Beijing style dishes, including Peking Duck. Optional Evening entertainment * Acrobatic show. The highlight of today's tour is a walk on the Great Wall of China. We visit the Mutianyu Section of the wall, which is quieter and less touristy, compare with many other access points. This section is also equipped with a cable car for those who prefer an easier way up (fee payable at local ticket office, approx £5). We allow plenty of time for you to walk along the wall and enjoy the unforgettable views. Our memorable day continues with a trip to see the 2008 Bird's Nest Olympics Stadium and enjoy great photo opportunities. Time permitting, we will have a stroll in the large Olympic square and see the Water Cube (exteriors only). After a full day visiting the many highlights of Beijing, enjoy a relaxing evening with free time for dinner on your own. This will give you a better opportunity to sample various dishes to your own liking. Our guide will be happy to make recommendations according to your requirement. A good dinner of your choice (with a beer/drink) should be no more than £10 per person. After breakfast, we visit the stunning 12th century Summer Palace, Kunming Lake and the Garden of Harmony. Next we take the ferry alongside the famous Marble Boat and enjoy a fascinating Rickshaw ride through the 'Hutong' traditional residential area of Beijing. For a great place to experience shopping in China and purchase some unique souvenirs, we can take you to the popular Xiushui Silk Market and shopping mall. In the evening, we take a flight to Xian, the former capital of China and starting point of the ancient Silk Road. An exciting day awaits, as we head to the Terracotta Warriors Archaeological Museum, home to over 6,000 life-size Terracotta Warriors and their horses. The warriors are meant to be the after life protectors of the first emperor Qinshihuang, who united China (221BC-206BC). Enjoy a selection of Xian's speciality dishes for lunch and afterwards we visit the Big Wild Goose Pagoda, built as a Buddhist Monastery during the Tang Dynasty. We enjoy the jovial atmosphere around the beautiful Pagoda and picturesque boulevards, where Xian residents come to socialise & relax. Evening entertainment includes: a re-enactment of the royal arts performance of a 7th century Tang Dynasty Show, with a special dinner of dumplings included. After breakfast we explore Xian's historic Muslim Quarter, home to a large Chinese Muslim community who have lived in the city since the silk road was first established. Enjoy walking through Muslim Square, along narrow winding streets crammed with shop stalls selling an array of interesting handcrafts and local food specialities. We also have opportunity to visit Xian's Wooden Mosque. Afterwards we walk to the majestic Bell Tower (exterior only) for a great photo opportunity. On the opposite side of the square we visit the famous Drum Tower, which provides fantastic views across the city. In the afternoon we enjoy a leisurely walk & optional cycle ride along the ancient city walls. The smooth & well preserved walls provide an ideal and safe walking & cycling route around the entire historic city centre. This is a charming way to enjoy the local lifestyle of Xian. 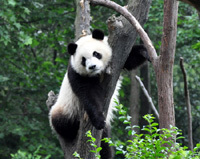 Late afternoon, take a flight to Chengdu, the home of China's most famous residents, the Giant Panda. Today, we visit the Giant Panda Breeding Research Base and allow plenty of time to watch the Panda's enjoying their playful activities and Bamboo meals. After lunch, we take a stroll down the historic Jin li Street and Kuan zai Ally to observe the local culture, traditional handicraft stalls and numerous wooden tea houses. Finally we transfer back to our hotel following a most memorable and enjoyable day. This will give you time to rest before making your own evening dinner arrangements. Chengdu is home to the famous Sichuan spicy cuisine and our guide will be happy to make recommendations according to your preference - mild hot, medium hot, or non spicy food! A typical good meal should be around £6 per person including a drink. Optional evening entertainment* Enjoy a variety style show in one of the best theatres in Chengdu, which includes the famous face-changing performance. Ask for prices & details at time of booking. In the morning enjoy free time at your leisure to further explore Chengdu, or take an optional tour to Leshan mountain to visit the Giant Buddha Statue (approx 2.5 hours each way). Upon arrival we will take a pleasant boat ride, during which there will be great opportunities to photo the huge statue carved into the hillside. In the afternoon, we transfer to the airport for your flight to Lhasa. Upon arrival in Lhasa you will be met and transferred to your the hotel where you can rest and adjusted to the high altitude. 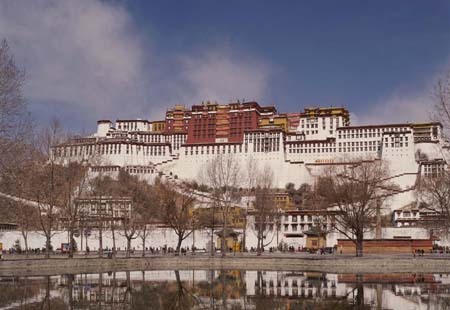 In the morning, we explore Lhasa city and visit the famous Potala Palace, which was built in the 7th century for the King. In the afternoon we visit Jokhang Temple and stroll in the famous local bazarr on Parkhor Street. Today we visit the Dreprung Monastery, which is the biggest Monastic University of Tibet. The fascinating complex incorporates many beautiful Buddhist chapels and colleges. Free time until our flight to Chongqing, the most populated city in China. Upon arrival, we have a city tour before boarding our Yangtze cruise ship in the evening. Enjoy magnificent views as our ship sails along the mighty Yangtze River. After breakfast, there is a scenic shore excursion to Zhangfeimiao or Fengdu (depends on sailing schedule). Entertainment and organised activities are available on board and you are invited to the Captain's welcome evening dinner in the evening. Todays shore excursion is to either the Shennong Stream or Lesser 3 Gorges (depends on sailing schedule). Our cruise today sails through the spectacular Qutang Gorge and Wu Gorge. Entertainment and organised activities on board, with a farewell dinner party in the evening. After breakfast we take a special shore excursion to see the Three Gorges Dam project and our cruise ship passes through the beautiful Xiling Gorge. Arrive at Yichang around noon, where you disembark and meet your guide. We then proceed to the airport for the flight to Beijing. Our local guide meets you upon arrival and we transfer to your hotel. Our Guide will meet you at your hotel and airport transfer will be provided to suit your departure flight times. Internal flights within China and Tibet including airport tax. Twin share price includes International flights with full ATOL Protection. (International flights based upon London, Heathrow departure). We can also arrange departures from your local airport. Selections of deluxe hotel accommodation in well furnished rooms with private facilities. We also arrange tailor made departure & private tours based upon this itinerary, please contact us to discuss your requirements. Flight Prices may be different around the bank holiday period in the UK, and festival periods in China. Please contact us for confirmation. Visa fee (please go to Our Visa Service for details). Tips for drivers and guides etc. Please see our FAQ page for further essential tour information.